It feels good to be back at a Bargue drawing again. This plate is going to be a challenge, being the first one to feature full modelling of light and dark, with half tones included. 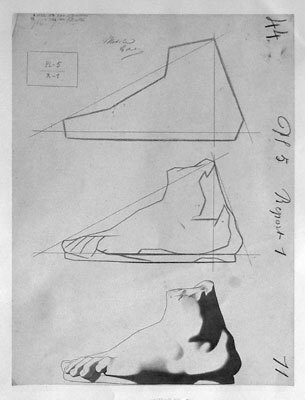 Bargue has supplied two schematic versions of the foot, and I’ll be following this progression of building up the drawing. Now that I feel I’ve got a reasonable idea of what I’m meant to be doing with these drawings, I’m going to make the write up for this drawing more in depth, covering the method I’m using in more detail. Hopefully the next few posts will serve as a good introduction to copying the Bargue drawings using the sight size technique. Since I expect this drawing to take some hours, and to be done as time allows over a few weeks, I’ll be updating this post at each stage with the latest progress. As I write this, I’ve spent around six hours on it so far and have reached the first schematic stage. What follows will be a blow by blow description of how I’m approaching this plate. First the set up. It’s important to make sure that everything is right at the start, since you don’t want things to start going awry after you’ve put ten hours into the drawing already. Drawing sight size means that the copy will be the same size as the original. I’ve had mine blown up to the original size of the plate on a dye sublimation printer, which gives better reproductions than a laser printer. I’ve got my paper taped up to the right of the plate, positioned so that the copy will end up in the middle of the paper. The easel is upright, and the board has been checked to be level with a spirit level. The first thing to do is to set up a plumb line that will be used to mark a vertical running through the drawing. All measurements will be taken from this line. What you can’t see in this picture is that I’ve also drawn a perfectly horizontal line which runs along the bottom of the drawing. These two lines have been transferred to the paper. One of the most useful things that practicing with the Bargue drawings has taught me so far is the general approach of working from the general to the specific. Look for the big shapes first, get the overall proportions right, and the detail will slot into place later. This seems to me to be an almost universally useful approach to almost anything, and certainly transfers to other types of drawing, and also to painting. With this in mind, the next step is to mark the four most important points on the drawing: the highest, lowest, furthest right and furthest left. I describe how to do that in the next post in this series. Hi Paul! Your website is such a gem! I’ve recently started doing Bargue studies, and I’ve found that I’m having a hard time trying to render in the lights and shadows to match the Bargue plates examples I’ve got. Would you be so kind as to give me a few pointers? I’ve tried searching around the internet but haven’t really found a way to correct what I’m doing. It’s hard to ay without seeing your work, to be honest. But in general, the best way to approach the shadow blogs is to do the main shape first, up the edge of where you can see solid black. Then gradually gradate the edge out from there. If you’re having problems controlling the charcoal enough to get an even gradation, I would try practising that on its own for a while: Draw a tall rectangle, about 2cm wide and say 10cm high. Start with the darkest value you ca get with your charcoal at the top, and then try to draw an even gradation to the white of the paper at the bottom. Do that repeatedly until you can get it even, they try applying that to your Bargue drawing. You should find your motor control much improved. hello , i have one question , if you are working with a paper copy of the plate taped to the board and will end up having the same size of your drawing what is the point of stepping back to the vantage point? Good question Eloy. The point is to practice the method so that when you come to cast drawings or portraits – or any other subject, for that matter – you will already have built skill in judging distances. 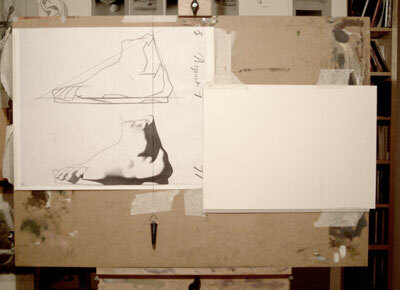 I know a lot of ateliers teach Bargue drawing right at the easel, some even using measuring to get them right. Personally, I think that approach misses building an important skill – judging distances. 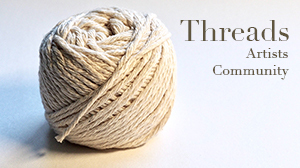 In fact, now I recommend estimating first, and then measuring with the thread to check your results and correct. That will build your skill at “eyeballing” very effectively. hello, what’s the size of it? I do them at the size they originally were, so 60cm by 46cm, or close to.